London - Oscar Pistorius on Tuesday played down his chances of defending his 100m Paralympic title, assessing that it could be the most open - and fastest - final in Paralympic history. The 25-year-old South African, a triple gold medallist in the T44 100m, 200m and 400m in Beijing, made history earlier this month by becoming the first double amputee to compete at the Olympic Games. But Pistorius said he would be happy for a medal of any colour in the 100m this time round, with the final likely to involve world record holder Jonnie Peacock and world champion Jerome Singleton. Pistorius said he had been "more than impressed" with Britain's Peacock, who in June lowered the world record for single leg amputees to 10.85sec. "He's a huge threat. But my personal opinion is that experience counts," he told a news conference at the Olympic Park. "Guys like Jerome Singleton (of the United States, whom Pistorius narrowly beat in Beijing) have run 11.1 in the last year. "He (Singleton) is a true professional, a very serious guy. He doesn't let competition get the better of him. "He's going to be just as much of a challenge. He's one of the only athletes to beat me in the 100." Event organisers have billed the T44 100m final as the race of the Paralympics, with predictions that all eight runners could break 11 seconds for the first time. Pistorius said the development of athletes in the event since Athens and Beijing had been "phenomenal", particularly in terms of physique, while margins between runners are now measured in hundredths of a second, not seconds. "There are six guys in my opinion or maybe someone else who could win,” he added. "There isn't a favourite in the event and that's that. That makes it very exciting. "The 100 is going to be a challenge for me... If I can finish in the top three I will be happy." 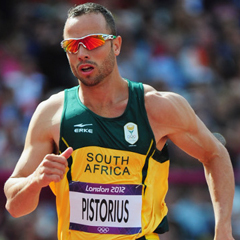 Pistorius comes into the Paralympics on the back of a semi-final appearance in the Olympic 400m before he anchored the South African quartet in the 4x400m relay. The athlete, dubbed the "Blade Runner" because he competes on carbon fibre blades, said he was in form, despite suggestions that he may be tired after the Olympics. "I have had 22 races this year. The Olympics was obviously very important, as are the Paralympics," he explained. "I'm in the right shape... I feel in great condition to be able to perform here."